When you’re involved in the world of business, it’s not unusual to find yourself in the position of being someone’s landlord. We see it happen every day. Owning a property and deciding to lease it out to be used for someone else’s business can be rewarding, but also tedious. We’ve gathered a list of tips and tricks to being a successful landlord so you’re never caught in an unhappy situation. It’s important to keep a lawyer in your back pocket to help with paperwork, negotiations, and more. Having a Real Estate lawyer draft up the paperwork will help eliminate risk of leasing out your property. It will also ensure you have copies of all the paperwork so you have a backup if needed. Some landlords treat their business as a hobby of investing. Unfortunately, if you treat the lessee with the same lack of determination you would a hobby, you could run into some problems. For one, they could walk out on the lease if it doesn’t hold a legal backing. Being present as a Landlord and not a “person with an expensive hobby” allows the lessee to see that it is your business and not just extra money in the door every month. Another key item to keep in mind is who you are leasing the building to. If they are a friend who you might think has a cool business idea, that’s okay. The agreement still needs to be put in writing and you need to be firm with your standards in the landlord-tenant relationship. A few key points to look for in a tenant could be the following: No Recent Eviction’s; No Recent Felonies; Must Make Three Month’s rent in a stable income, etc. 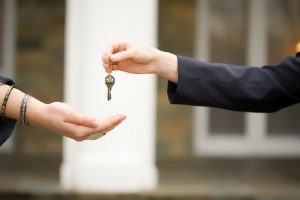 We’re always available to help you plan your lease agreement as a new landlord or to help you with current complications that may arise throughout your time as a Landlord. If you ever need advice on what to do, or who to lease to, contact us to chat with our real estate agents today!